25% off every 3rd order! Available as a spot on, it is easy to apply and treats the whole animal. 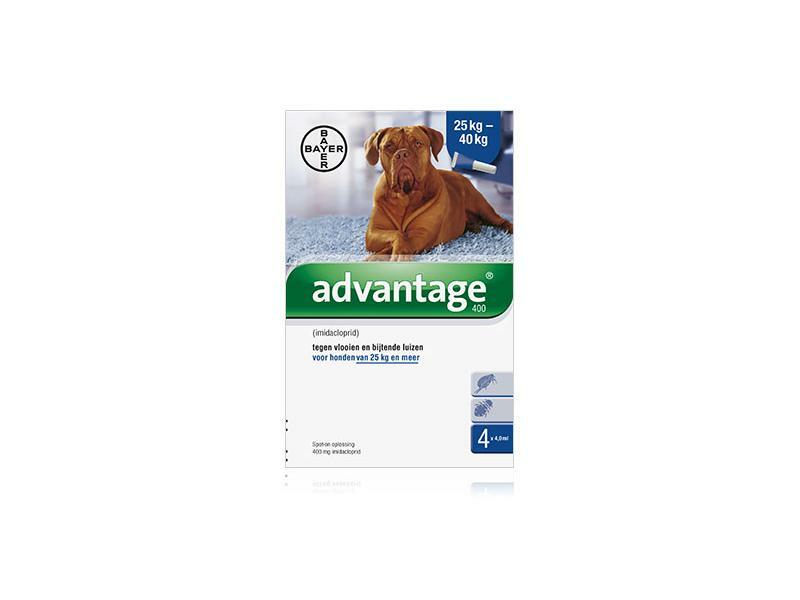 Advantage can be used on dogs from 8 weeks of age. It is safe to apply to lactating females and doing this will treat the puppies as well as the adult. Below are some recent questions we've received regarding Advantage Flea Control 400 Extra Large Dogs Over 25kg, including answers from our team. Please could you tell me what the active ingredient in Advantage flea control is please? It is safe to apply to lactating females and doing this will treat the puppies or kittens as well as the adult, and can be used on dogs from 8 weeks old. Can Advantage kill harvest mites? Advantage treats fleas (on cats and dogs) and biting lice (on dogs) only. Can I use this on my cat who is nursing 2 week old kittens? Yes you can use the Advantage flea control on your cat while she is nursing her kittens. Does this product need a prescription? No you do not need a prescription for Advantage but you do for Advantix. When can I use an alternative? Advantage has stopped working on my elderly cat (20yrs old). How soon can I use an alternative - I applied Advantagge 2 weeks ago and she still has fleas. It should be safe to try an alternative now if it has been 2 weeks since she last had Advantage. However it is unlikely that the Advantage has stopped working but that you need to treat the house too with a spray such as Indorex. Fleas hide in carpets, curtains, furniture, pet bedding etc and then can jump back onto your cat. Even if your cat has been treated it will take around 24hrs before the fleas are killed. Brought the Guinea pigs in for winter and I really don't want the cats to get fleas. Will this dosage be suitable for Guinea pigs? Unfortunately this product is not suitable for use on guinea pigs as it is only licensed for use on dogs, cats or rabbits. I am looking for advantage puppy flea treatment for a twelve week old puppy weighing approximately 12 kilos do you sell it and for how much? Advantage is safe to use on puppies from 8 weeks old. If your puppy is 12kg then you will need Advantage 250 spot-on. There is nothing on the Advantage data sheet to say there is a minimum weight at which it can be used, just that kittens should be over 8 weeks old, so it should be fine. However, if you are concerned you could use Fiproclear Spray instead which is suitable for use on all sizes of dog and cat from 2 days old. Will this help with fur mites on rabbit? Thanks for your question. Advantage wont treat mites, I'm afraid. You could try Pharmaq Ivermectin for small animals (item no 149772).